One has to make a number of adjustments to live on-board the giant floating hotel that is the MS Westerdam. These adjustments are not in any way difficult, or even an inconvenience, really. Sure, the Internet access might sometimes be slower than dial-up, and night doesn’t start rolling in until about 11 p.m. But “slow internet” still seems pretty impressive given our location, and the lack of dark means I don’t have to waste PowerBook battery life on keyboard lighting during those 3 a.m. WarCraft sessions. As such, the process of acclimating to shipboard life is simple enough and nothing to be afraid of. Until you enter the bathroom. Rather than the traditional siphon-jet flush mechanism of a typical land-based toilet, shipboard toilets use a vacuum design. Press the flush button and—after a completely silent, extremely suspenseful pause—the contents of the toilet bowl will seemingly be instantaneously sucked down the toilet drain. Personally, as a child I never wrestled with a fear of going down the drain, but apparently the suction in these toilets is strong enough that I might need to re-visit this belief. 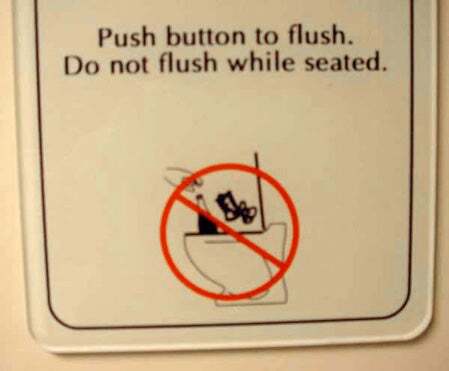 As near as I can tell, the “don’t sit while flushing” warning stems from the concern that if you sit on the toilet while hitting the flush button, your posterior might create a strong enough seal that the vacuum created inside the bowl could actually disembowel you. As disgusting as this might be, it’s hard not to be impressed with this device, and even harder not to think “Wow, my cabin comes complete with a really strong vacuum pump, built right into the wall!” And, this being a Geek Cruise and all, I would be remiss in my geekly duties if I didn’t consider the possibilities of a potential new hobby: toilet hacking. For example: fit the top of the bowl with some kind of tight-fitting “skirt” and a hose and I could turn my cabin’s toilet into a fairly powerful vacuum cleaner. Similarly, I have to imagine that glass blowing gear can be had at any of these quaint medieval villages we’re visiting. When combined with my complementary vacuum pump, I could make my own light bulbs. The possibilities seem endless, and toilet hacking might provide a great diversion at 2 a.m., while waiting for the sun to set. If anyone has any ideas, I’d love to hear them.